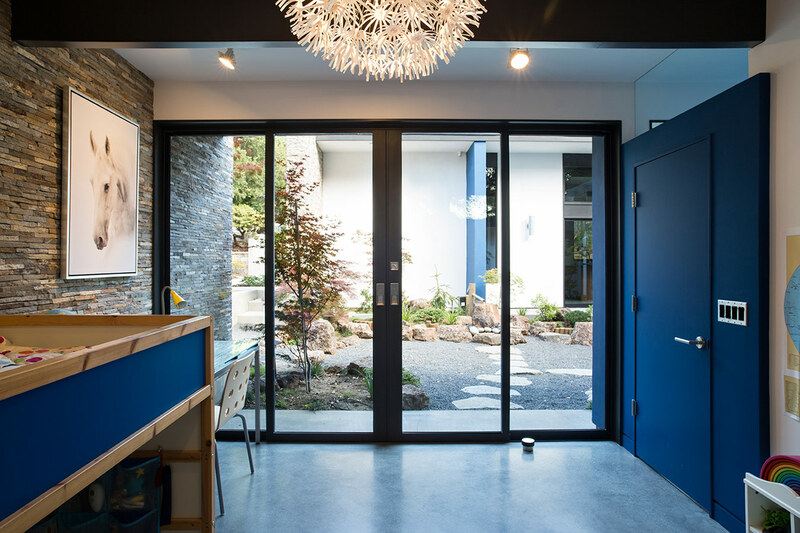 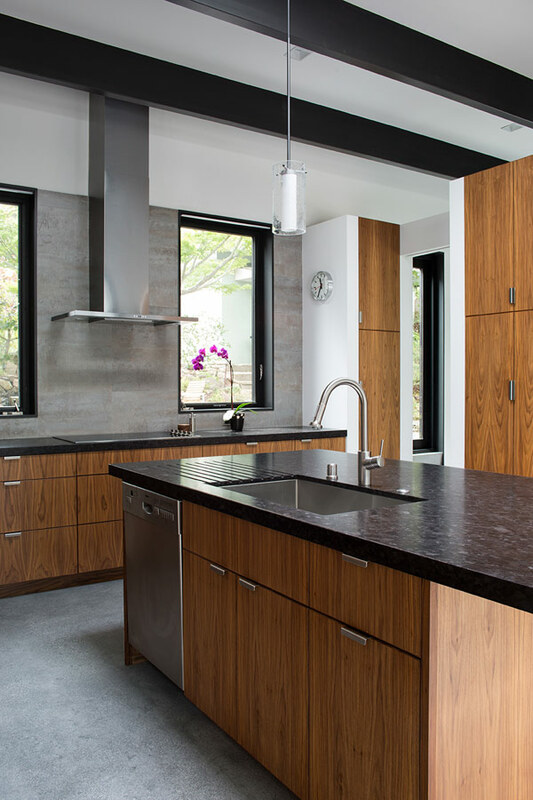 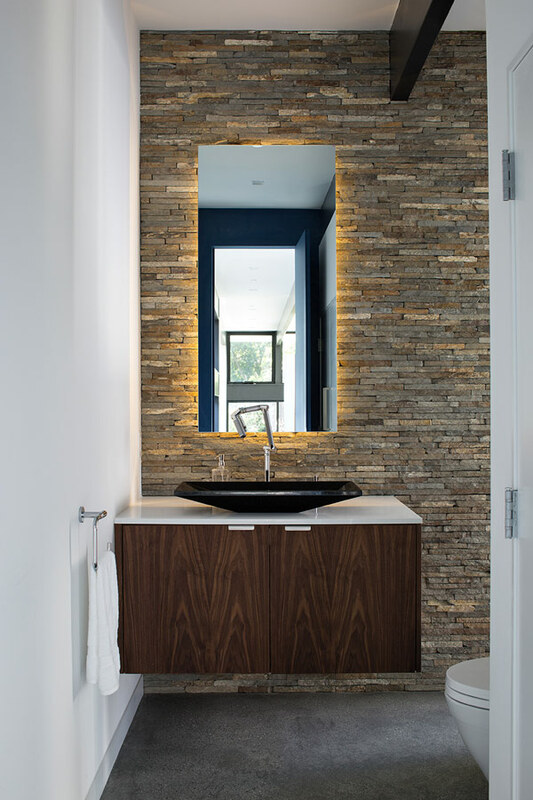 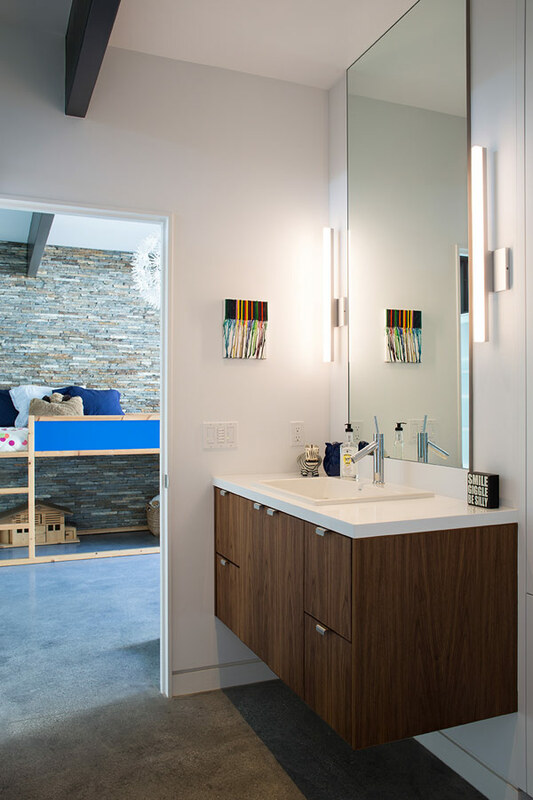 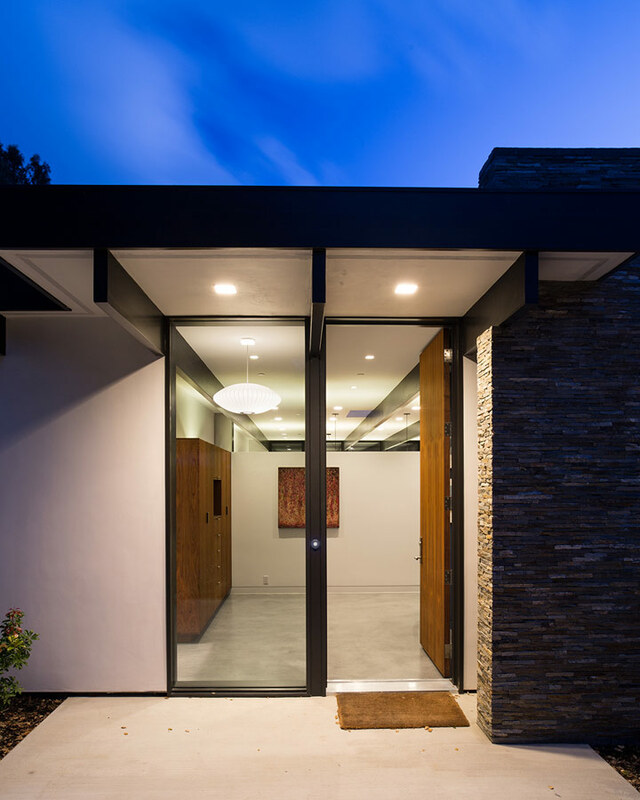 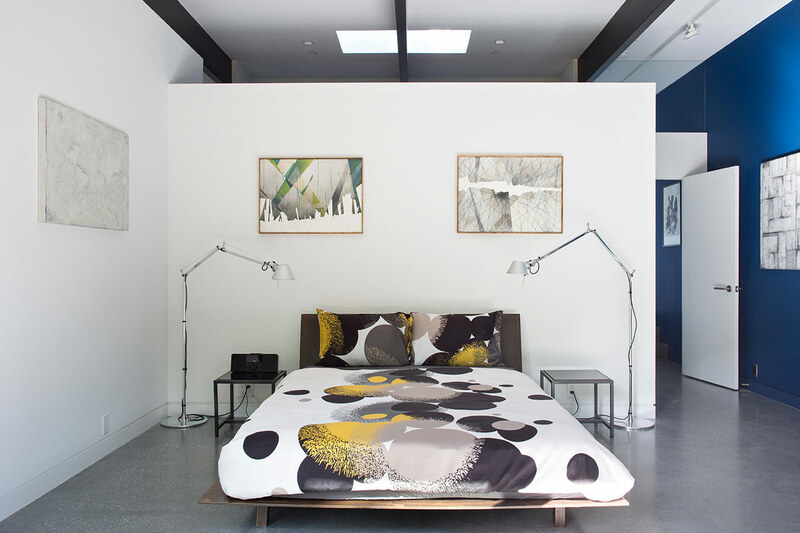 The owners, inspired by mid-century modern architecture, hired Klopf Architecture to help them decide: remodel and add to a 1940s modern house or start fresh with an Eichler-inspired 21st-Century, energy efficient, all new home that would work for their family of three. 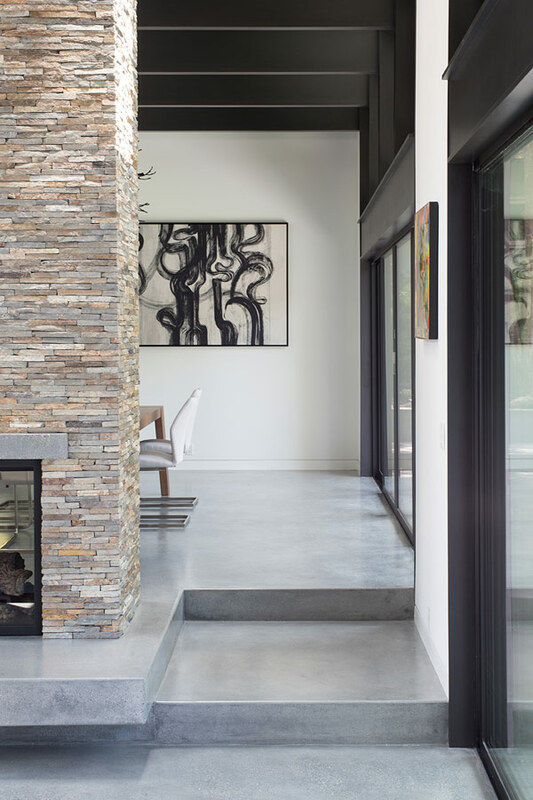 With the decision made to start over, Klopf and the owners planned a home that follows the gentle slope of the hillside while the overarching post-and-beam roof above provides an unchanging datum line. 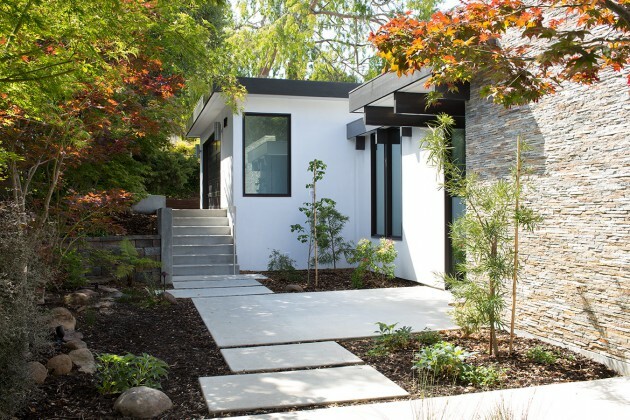 Every square foot of the house remains close to the ground creating a sense of connection with nature. 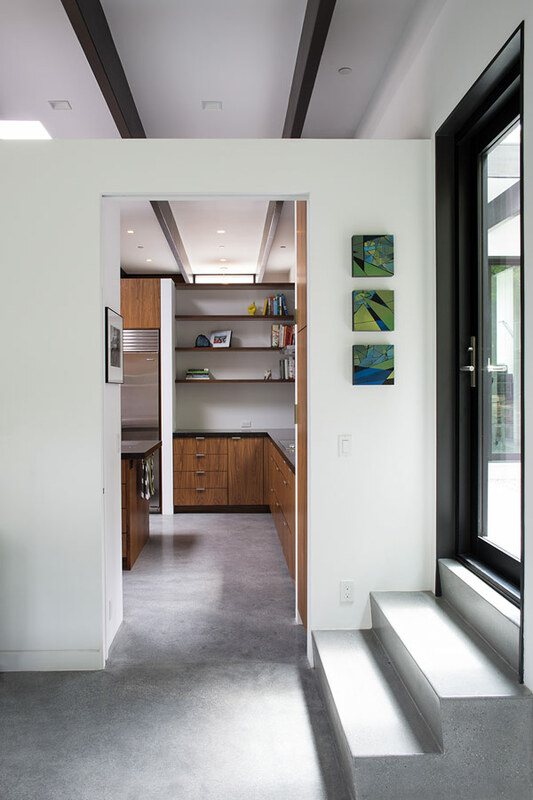 The resulting increase in ceiling height with each step-down helps create the hierarchy of the public spaces (living room is tallest, then dining, then kitchen, then entry). 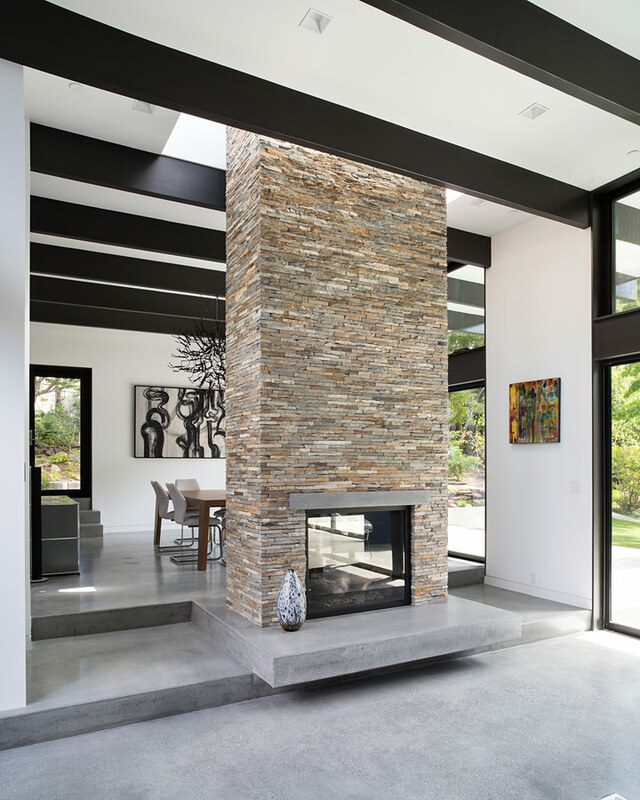 A rational layout based on four-foot-wide beam bays brings a calm composure to the space while the central stacked stone fireplace chimney shooting up through a skylight contrasts that with some fanfare. 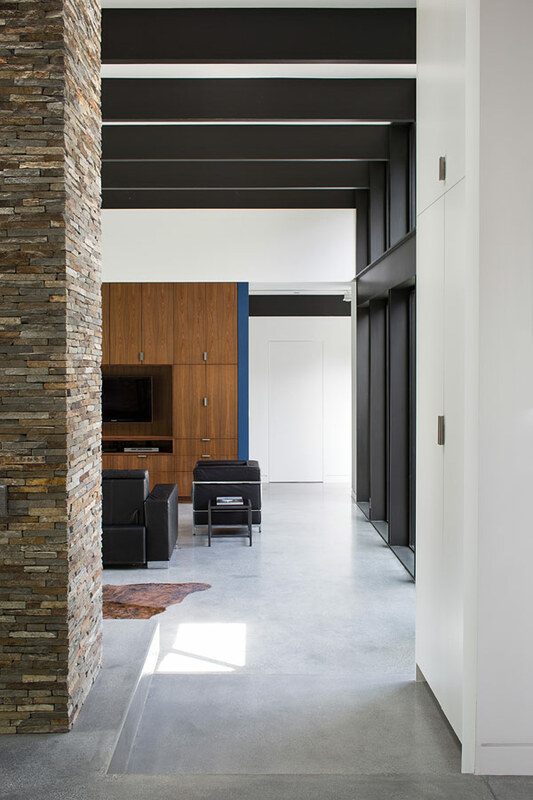 Unassuming planes of stacked stone down below street level belie the roomy, open spaces that are progressively revealed as one flows through this Modern Atrium House. 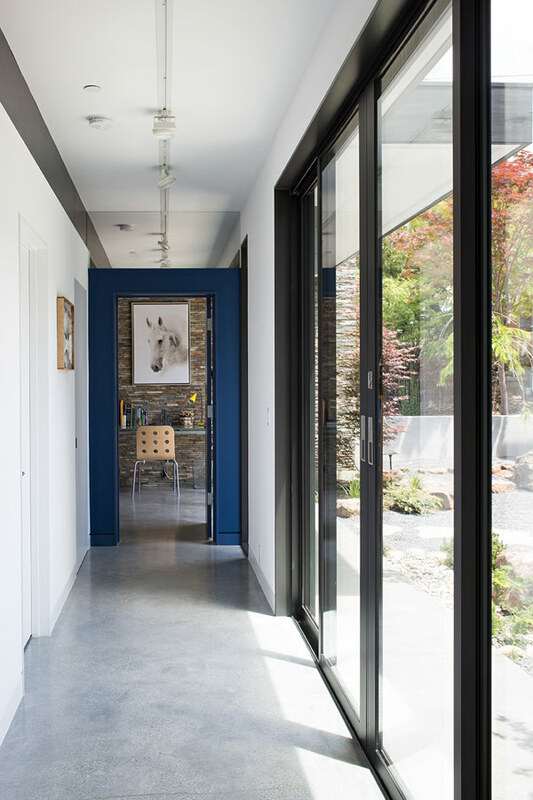 Enter through the front door into a foyer that provides glimpses beyond of the continuous post-and-beam roof, then round a corner and pass an atrium visible to your right with views up ahead of the rear yard through a large glass wall. 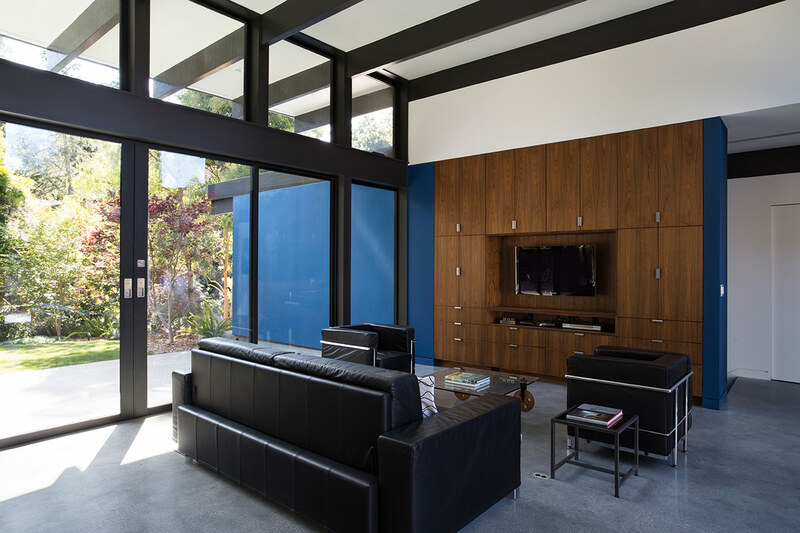 As the sloping site drops away from the street, the house continues to step down to a large living room that’s bounded on both sides by glass walls. 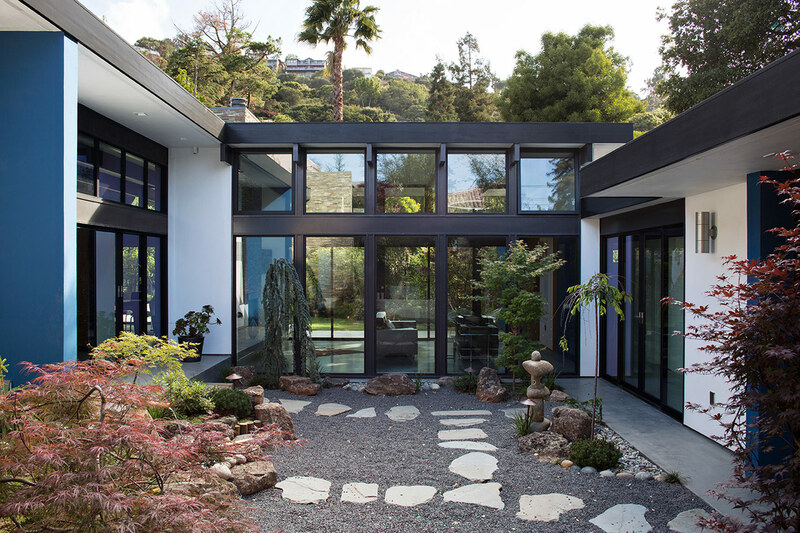 Look to the rear to take in the larger-than-usual green and natural back yard. 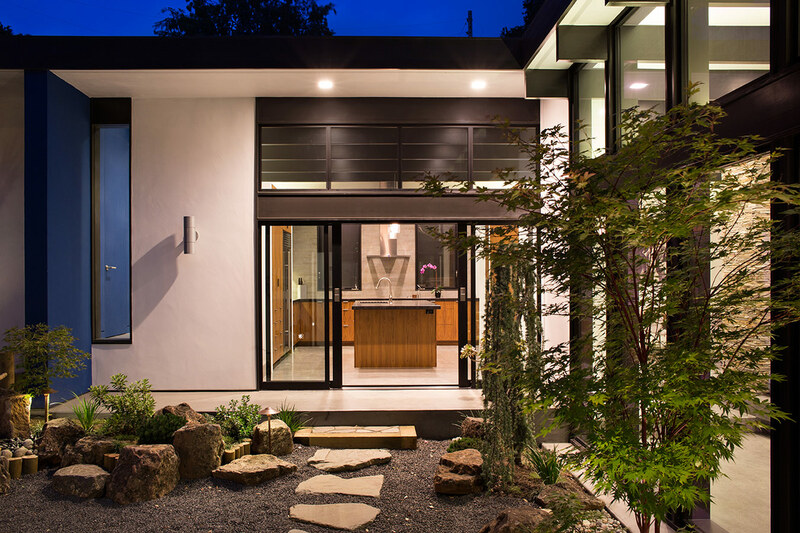 Look back toward the street to see the landscaped atrium and beyond that a wall of trees separating the house from the street. 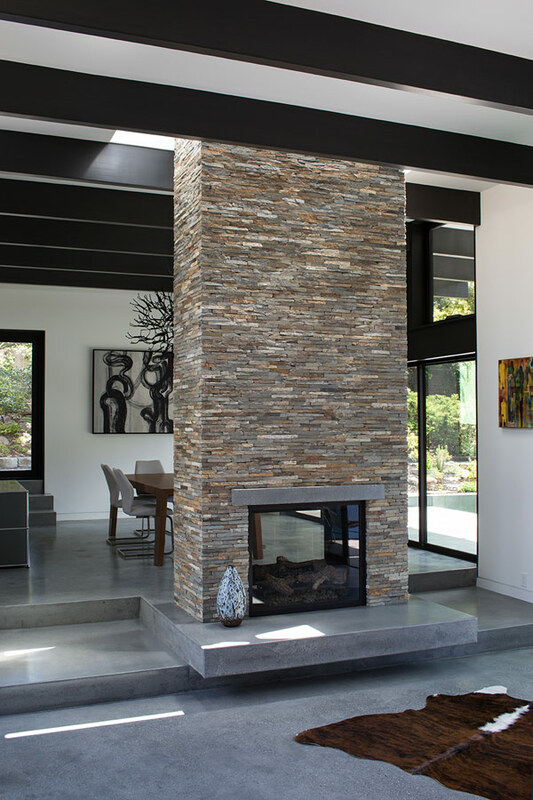 The indoor/outdoor feeling in the house is most intense in the living room, but certainly present in every room of the house. 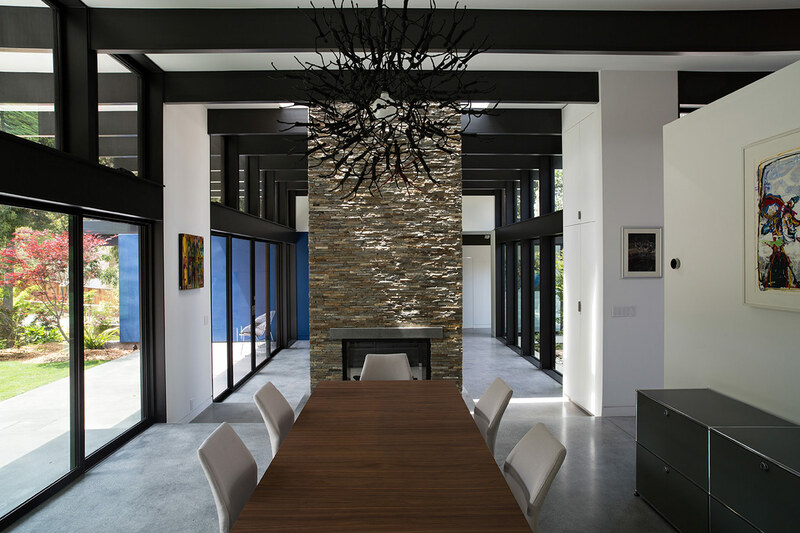 The changing moods of nature are reflected in the house due to the direct outdoor views at nearly every vantage point in the house. 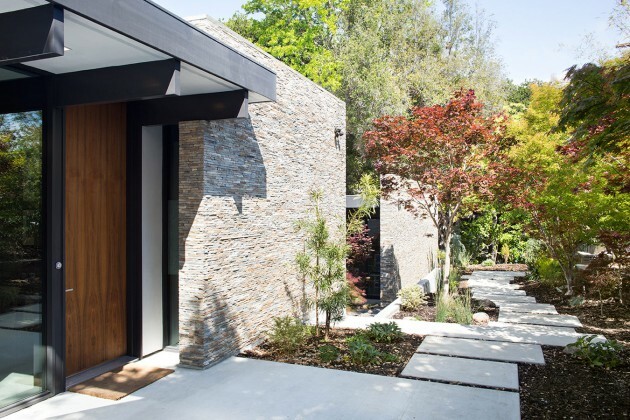 But with the house being on a large, wooded lot and down below the street, the owners are connected to nature all around but still afforded privacy from all sides. 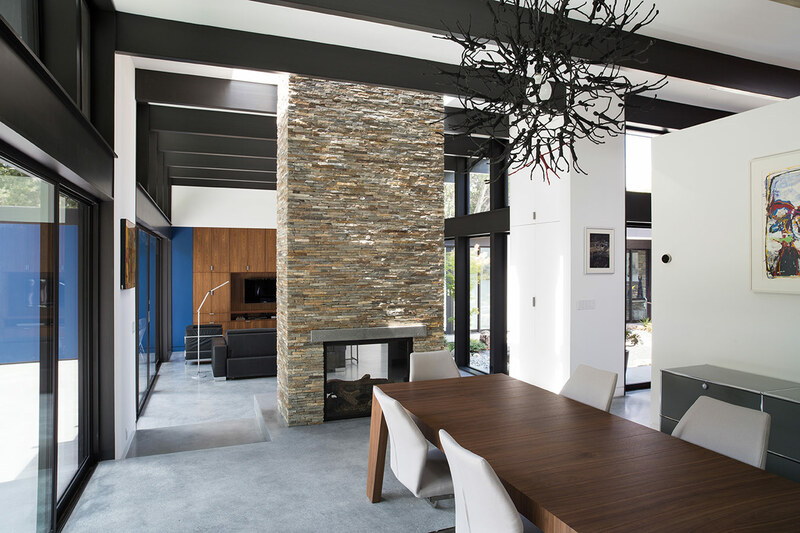 Although very open and connected to nature, the house is not at the mercy of the elements. 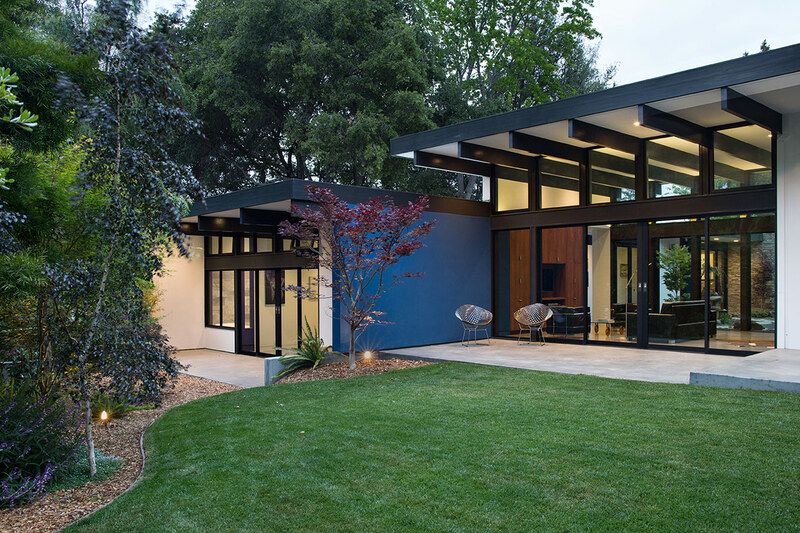 Roof overhangs protect outdoor spaces and shade the house from unwanted sun. 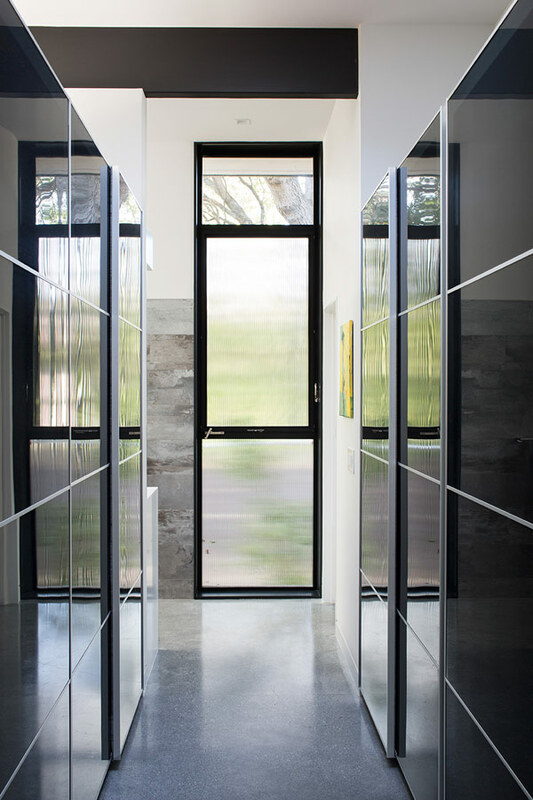 Where unwanted sun couldn’t be shaded, heat mirror glass keeps the heat out so that there is no need for air conditioning in this house. 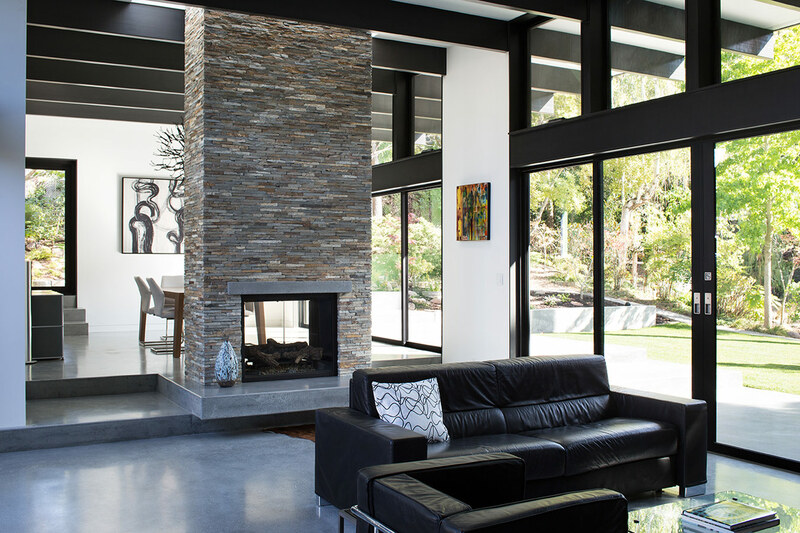 The large aluminum sliding doors and windows are insulated and most have thermally-broken frames, the walls and roof are super-insulated, and the in-floor radiant heat is in a separate, insulated radiant slab, so even with expansive glass, the energy performance of this house exceeded California’s strict energy code by almost 40%.